Tom Clancy’s Rainbow Six franchise has always been about tactical shooting; planning your entry, attack and exit in a way that minimises civilian casualties, keeps your team out of harms way, and takes down the bad guys quickly. The last game in the series, Rainbow Six: Vegas 2, came out over 7 years ago and Ubisoft are now ready to bring the franchise back with Rainbow Six Siege, which is due out in December this year. A closed beta for Rainbow Six Siege took place at the beginning of October and I joined in and played on the PlayStation 4 in order to bring you my thoughts on how the game appears to be shaping up. Rainbow Six Siege is all about tactics, and in that respect little has changed for the Rainbow Six franchise in the last 7 years. However unlike Vegas 2, which featured a full length solo campaign, a co-operative mode, and an online competitive multiplayer mode, Siege focuses almost exclusively on online multiplayer. 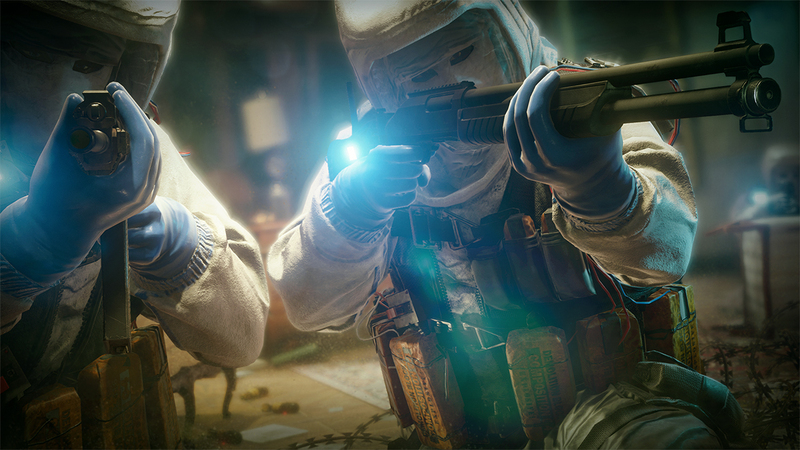 The closed beta showed off two of Siege’s game modes: multiplayer and terrorist hunt. Multiplayer saw 5 human-controlled counter-terrorists taking on 5 human-controlled terrorists. There were bomb- and area-related objectives in this mode, but ultimately these were consistently overshadowed by the simple philosophy that killing the other team first ensured success. This mode played very much like Counter-Strike (where it also doesn’t matter if you rescue the hostages as long as you kill the other team first) with short, snappy rounds taking place across small maps. Walls, ceilings and floors can be destroyed by explosives, bullets and melee attacks. Terrorist hunt, on the other hand, saw 5 human players clearing 22 AI terrorists from the beta’s small maps. The difficultly mode selected determined just how smart the terrorists were, and the top difficultly level really showed off Siege’s surprisingly good AI. At this level the AI terrorists were capable of setting traps, flanking your team, and working effectively as a unit. Terrorist hunt could also be played alone, and this looks like it will form the single-player portion of the final game. The closed beta actually played very well, and I didn’t encounter any glitches or technical issues other than the expected connectivity issues. Online disconnections were fairly frequent, but no doubt the majority of these will be ironed out before the game’s full release. Otherwise all of the game’s mechanics functioned well and the graphics, whilst not groundbreaking, were pretty decent. Performance was also consistent in the closed beta, no matter how chaotic the gameplay got, which was very encouraging. When I played Siege online with a good team, who understood tactical play and communicated well with each other, it was a lot of fun. The ability to breach through walls, ceilings and floors (or reinforce them against breaches when I was playing on the terrorist team) kept the gameplay feeling fresh and interesting as well as dynamically changing the maps. From a tactical point of view the destruction mechanics also often created a dilemma; was it better to blow up part of a wall to enter a room therefore avoiding the door, or did this reduce cover and make my team and I more vulnerable? 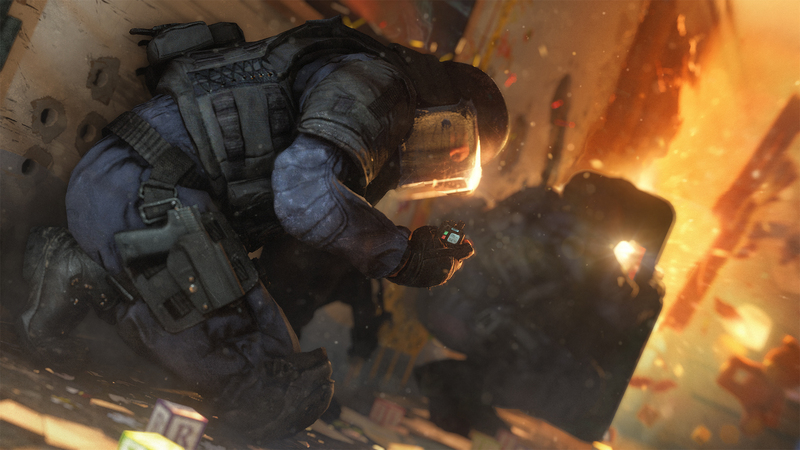 Rainbow Six Siege’s closed beta had solid and enjoyable gameplay. The destructibility of the maps is going to be a great feature in Rainbow Six Siege when the final game comes out. Whilst not every part of a building can be blown up, the game always tells you what can and can’t be breached, and overall this mechanic feels like a natural progression to the tactical destruction introduced by Dice in Bad Company 2. You won’t be taking down whole buildings in Siege, but you can certainly change the layout of the game’s small maps dramatically and this destructibility feels like a key component of Siege’s tactical play, something Battlefield seems to have moved away from in favour of larger, map altering set pieces. With good team mates, playing against decent opponents (or the game’s AI) in Rainbow Six Siege’s closed beta was enjoyable. The small maps and quick rounds were characterised by moments of careful planning followed by sudden, chaotic firefights. Where Rainbow Six Siege fell down, however, was when team mates didn’t play well together, choosing to run in guns blazing instead of focusing on tactical team play. This happened far too often in the closed beta unfortunately, and Rainbow Six Siege feels like the sort of game that will need to be played with friends, or regular team mates, in order to be enjoyed. Furthermore the maps, or at least those on offer in the closed beta, were all quite small and samey, and so it was easy to quickly learn their layouts, both as an attacker and a defender. The speed of the multiplayer rounds also meant that I spent a lot of time in menus waiting in Rainbow Six Siege’s closed beta and I have a feeling this will be the case in the full game too, especially as there isn’t a proper single-player campaign to get stuck into. After playing Rainbow Six Siege’s closed beta I do have some concerns for the full release, particularly in regards to the game’s lack of narrative and single-player mode. Whilst the terrorist hunt mode will be playable alone, it ultimately amounts to nothing more than entering a map, killing the terrorists and earning XP points and renown for better equipment. It’s just the online mode without other players, and without any context or story this mode quickly begins to feel stale and dull. The multiplayer mode also began to feel this way in the closed beta, especially when I was playing with strangers who didn’t want to play tactically as a team. In other words Siege’s aimless shootouts just weren’t that much fun after an hour or two as there wasn’t any narrative driving me forward. Whether the full game will offer any narrative or not within its modes remains to be seen, but it’s hard not to liken Rainbow Six Siege to Titanfall or Evolve at this point; no matter how fun, original or different the gameplay is it quickly begins to feel hollow, repetitive and uninteresting due to a lack of narrative and the focus on multiplayer-only modes. Rainbow Six Siege’s lack of single-player and narrative is a concern. With its reliance on multiplayer it’s hard to see how Rainbow Siege will draw and keep gamers’ attention, and it’s even harder to justify its full retail price of between £40 and £50. Rainbow Six Siege is coming out in December and so will be in direct competition with Call of Duty: Black Ops III and Halo 5: Guardians, both of which offer a full solo campaign (on current generation consoles anyway), and online multiplayer. In fact both Call of Duty and Halo are looking to make it big in the eSports arena, and this could draw attention away from Rainbow Six Siege’s own multiplayer. There’s also Destiny to consider, which has recently seen update 2.0 launch further improving the game and finally adding a decent narrative. In other words, there are a lot of first-person shooters out now, or coming out soon, and I’m not sure Rainbow Six Siege’s tactical focus will be enough to attract players to it, especially when Counter-Strike has already been doing this for the last 7 years. There does seem like there will be fun to be had in Rainbow Six Siege though. Multiplayer rounds should be intense and with like-minded players the tactical elements in Rainbow Six Siege’s gameplay should help differentiate it from its peers. 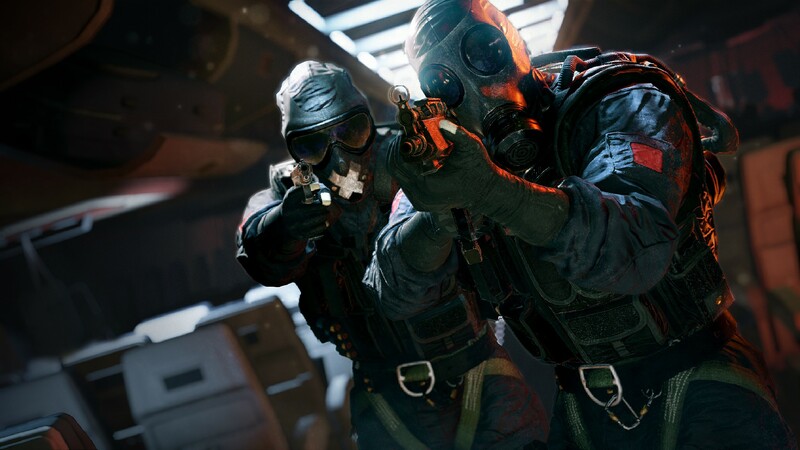 However, based on the closed beta Rainbow Six Siege’s gameplay feels repetitive and only time will tell whether the full release has anything further to offer. If you like tactical shooters then Rainbow Six Siege should be right up your street, but it’s worth bearing in mind that it’s not doing anything particularly different to other games; it’s just combining Bad Company 2’s destructibility with Counter-Strike’s gameplay. Overall the Rainbow Six Siege closed beta showed off a polished and fun game, but also brought into question just how much content the game will offer as a full priced release. It’s hard to shake the feeling that Rainbow Six Siege won’t do enough to keep gamer’s attention, and I would bet that many gamers will pick it up at a discounted price after Christmas, or play it for a short while before trading it in for something with a bit more substance.